When working in an industrial environment, or any environment for that matter, SAFETY COMES FIRST. There are many guidelines and best practices when operating material handling equipment that uses a chain as its lifting mechanism. In every case, the manufacturers recommended chain container should be used. 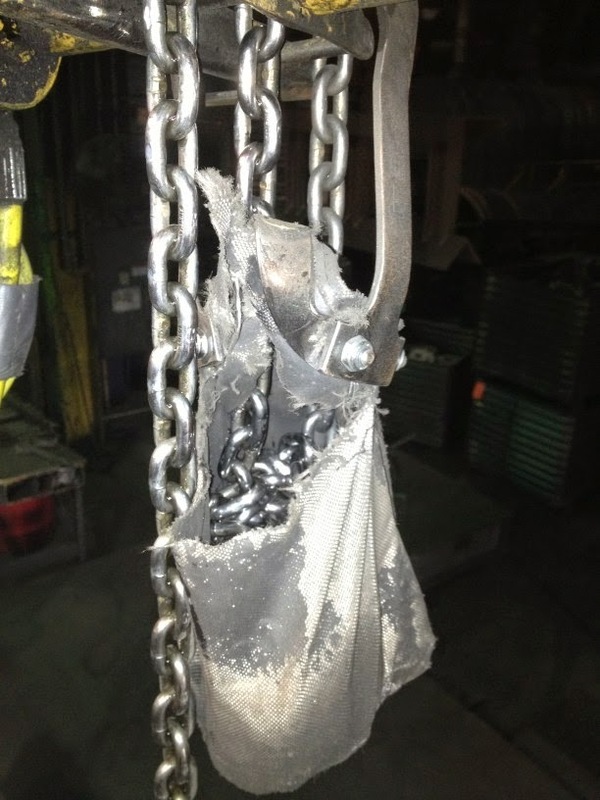 The following article, written by John Funderburke of Ace Industries, Inc. Service Department, will delve into the reasons you should always use the manufacturer recommended chain container and always avoid using a make-shift chain container. Each manufacturer makes their own chain container for each model, and some manufacturers have universal chain containers that fit multiple models. The shape and size of the hoist determines the shape and design of the chain container and mounting hardware for each hoist. It is never a good idea make your own a chain container such as a zip lock bag, large diameter PVC pipe, and five gallon buckets just to name a few genuine unique designs I have seen. 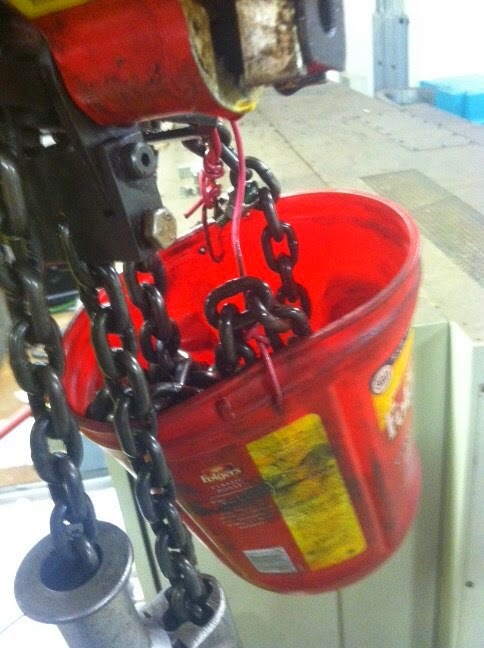 Chain containers should be used when the dead end of the hoist chain could be a danger to the employee. Here are some examples of make-shift chain containers that pose a serious threat to everyone safety in the facilities they were being used in. As you can see, many of the applications are starting to tear and break. If they are not replaced with manufacturer recommended chain containers promptly than they are putting their employees in danger. 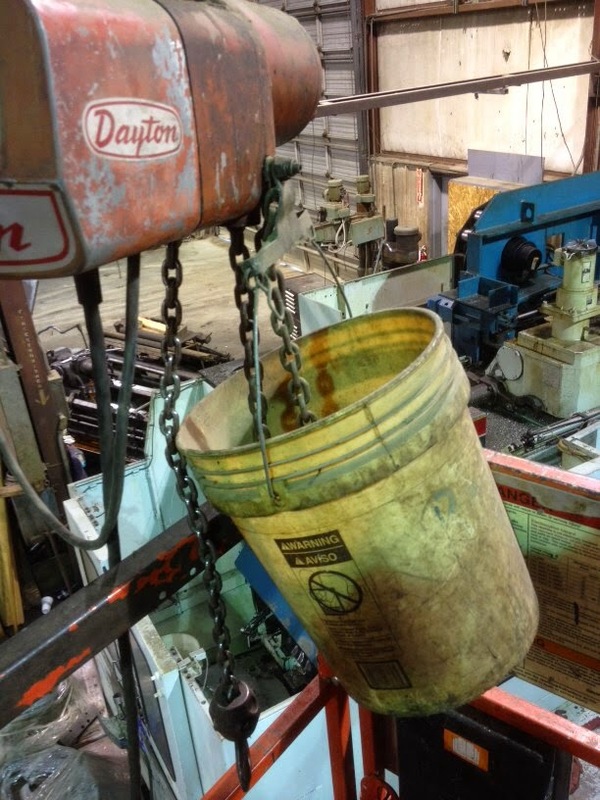 If the chain container were to fall off or break, the chain of a hoists suspended over walkways or forklift paths could potentially land on someone and severely injure them or land on and damage an expensive piece of equipment. Additionally this loose chain is no a hazard for employees who are walking on the path or forklifts and other material handling equipment driving on the path. Rotating machinery such as lathes and loose chain do not mix well at all. 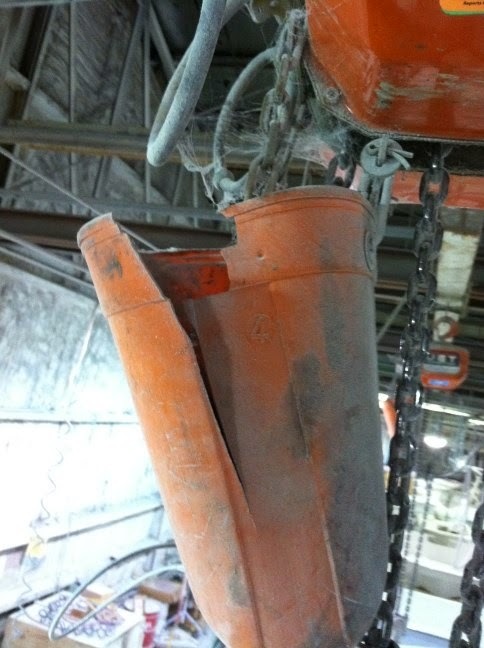 The thought of load chain being wrapped up in any turning machinery is a scary thought and could lead to major catastrophic damage and injury. In addition to safety reasons, It is also a good idea to use chain containers in dusty areas and harsh work environments. 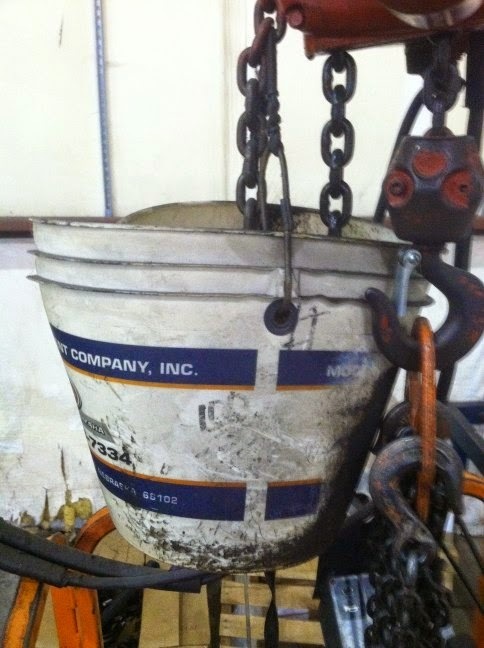 Storing chain in a chain container keeps it lubricated and prevents the chain from collecting dust. In outdoor applications chain containers are used to store the chain when hoist is not in regular use. This keeps dust from collecting on the lubricated chain and helps the chain to stay lubricated. Chain containers used outdoors need to have a drain hole in the bottom to keep chain container from holding water due to rain and precipitation. Just remember when it comes to hoisting equipment it is best to use the manufacturers original parts. 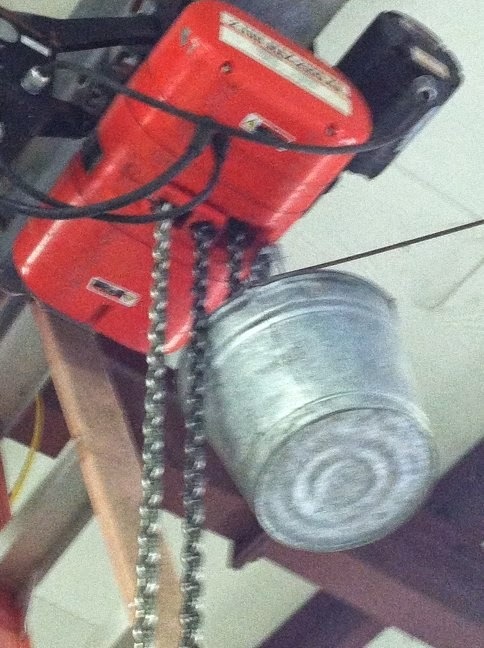 This takes the liability off of you if the chain container should fall. Visit our website to browse our wide selection of chain containers and all your other hoist replacement parts. Certified Crane Care is here to help you with your overhead crane and hoist safety. Our expertise includes Fall Protection training, inspections, repairs, modifications and modernization to help your company meet and exceed your safe operation needs. We know the importance of having a zero-injury workplace, whatever it takes.